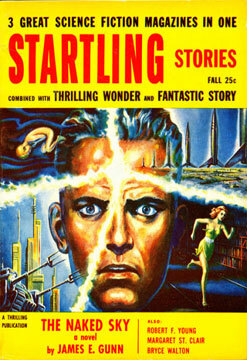 Startling Stories was a science fiction pulp published from 1939 to 1955 by publisher Ned Pines' Standard Magazines. It was initially edited by Mort Weisinger, who was also the editor of Thrilling Wonder Stories, Standard's other science fiction title. 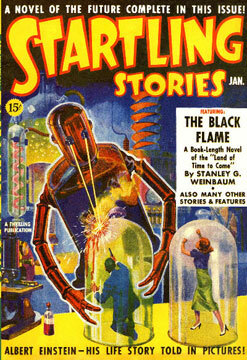 Startling ran a lead novel in every issue, starting with The Black Flame by Stanley G. Weinbaum in January 1939. 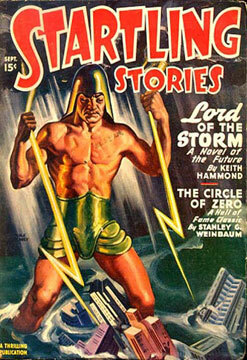 When Standard Magazines acquired Thrilling Wonder in 1936, it also gained the rights to stories published in that magazine's predecessor, Wonder Stories, and selections from this early material were reprinted in Startling as "Hall of Fame" stories. Under Weisinger the magazine focused on younger readers and, when Weisinger was replaced by Oscar J. Friend in 1941, the magazine adopted a more juvenile focus, with clichéd cover art and letters answered by a "Sergeant Saturn". Friend was replaced by Sam Merwin, Jr. in 1945, and Merwin was able to improve the quality of the fiction substantially, publishing Arthur C. Clarke's Against the Fall of Night, and several other well-received stories. Much of Startling's cover art was painted by Earle K. Bergey, who became strongly associated with the magazine, painting almost every cover between 1940 and 1952. He was known for equipping his heroines with brass bras and implausible costumes, and the public image of science fiction in his day was partly created by his work for Startling and other magazines. Merwin left in 1951, and Samuel Mines took over; the standard remained fairly high but competition from new and better-paying markets such as Galaxy Science Fiction and The Magazine of Fantasy & Science Fiction impaired Mines' ability to acquire quality material. In 1952, Standard attempted to change Startling's image by adopting a more sober title typeface and reducing the sensationalism of the covers, but by 1955 the pulp magazine market was collapsing. Startling absorbed its two companion magazines, Thrilling Wonder and Fantastic Story Magazine, in early 1955, but by the end of that year it too ceased publication. Ashley, Michael (1976) [First edition 1975]. The History of the Science Fiction Magazine Vol. 2 1936–1945. Chicago: Henry Regnery. ISBN 0-8092-8002-7. Ashley, Mike (2005). Transformations: The Story of the Science Fiction Magazines from 1950 to 1970. Liverpool: Liverpool University Press. ISBN 0-85323-779-4.